Keeping an accurate timesheet is extremely important, both for employees as well as for the employer. Keeping a timesheet is easier said than done though, that’s why there are dozens of different machines, software programs and alternative methods for recording who worked what hours. There’s no need to invest that kind of time, money or energy into keeping track of hours worked though. All someone really needs is a computer with Microsoft Excel on it, and an Excel daily timesheet template to help keep track of all the necessary hours. How Does an Excel Daily Timesheet Template Work? 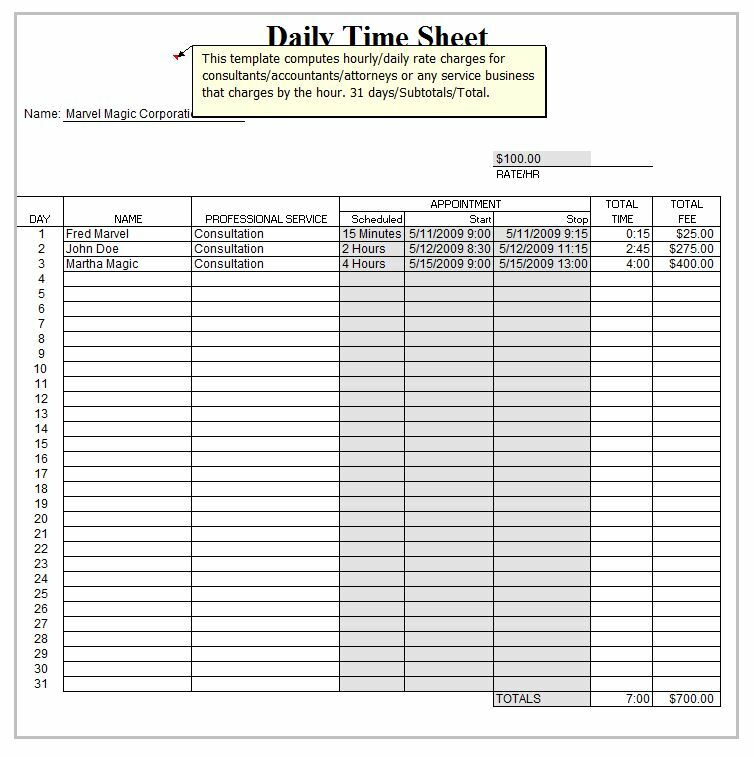 An Excel daily timesheet template is a simple, pre-made template that can be used to keep track of daily hours worked by employees. When an employee comes to work he or she opens up the template, names it for the day, and then fills out when he or she began work. When the employee takes a break, that’s put into the timesheet, and when he or she clocks out for the day the employee signs out on the sheet. The template then automatically calculates the hours someone worked, and it makes a simple, easy to read record of that employee’s day. Get Your Excel Daily Timesheet Template Here Free! These templates are fairly easy to get, especially since we offer them for free. All a user needs to do is go to the link provided, and download the Excel daily timesheet template. Once it’s downloaded all someone has to do is open it up, and then save it with a more specific name (Michael 10/15/2013 for instance). Once the template has been re-saved under another name the employee in question can fill it out throughout the work day, saving it to an “hours worked” file that can be easily tallied up at the end of the weekly or bi-weekly time period. In the event that something happens to the original template file, all one has to do is come back and download another file. There’s no limit on how often someone can do this. As such one could put the file on a slew of different computers, as well as on different units at different stores. If the original template is lost, or corrupted, then all one has to do is download a free replacement. There’s no muss, and no fuss. We just want to help business owners save time.